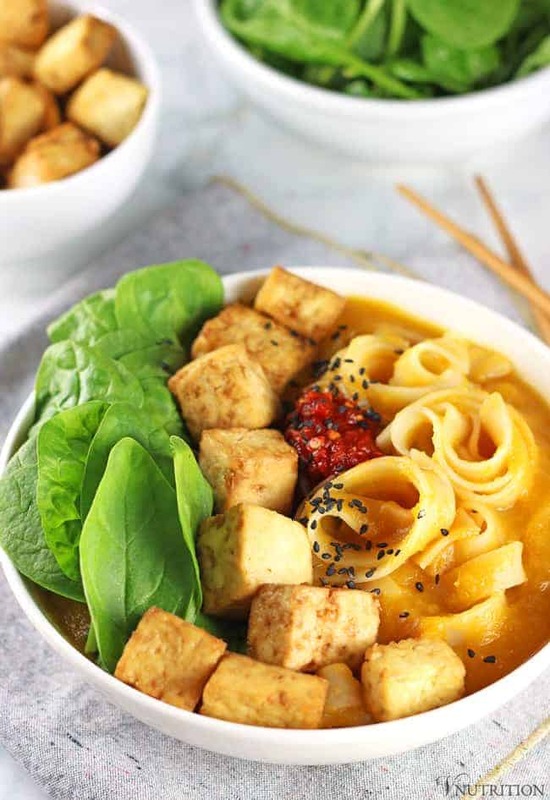 This Butternut Squash Noodle Bowl is easy to make and a healthy meal for dinnertime. It’s gluten-free and creamy without the dairy. This warming bowl is the perfect for those chilly nights when you need some comfort food! When fall hits, anything winter squash calls to me. I love pumpkin, which you obviously know if you’ve been on my site a few times. 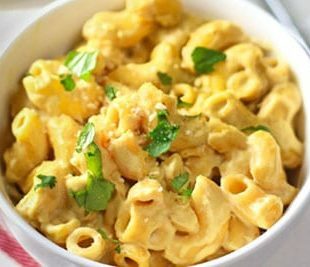 I use pumpkin in lots of my dishes like my Pumpkin Mac & Cheese, Sweet Pumpkin Hummus, Creamy Pumpkin Pasta, and Baked Pumpkin Oatmeal (just to name a few). 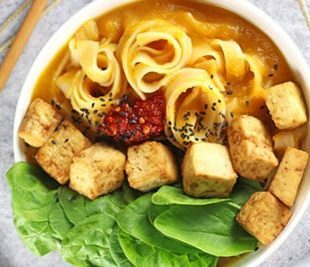 Butternut quash is another tasty winter squash and it doesn’t always get the props it deserves so I thought I’d make a nice big bowl of noodles using butternut squash. 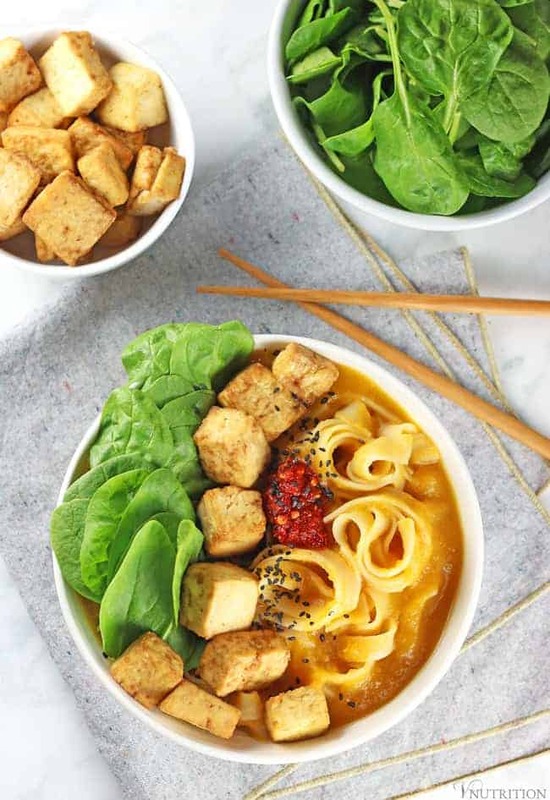 My Butternut Squash Noodle Bowl is healthy as well as tasty and I think you’ll really enjoy it. 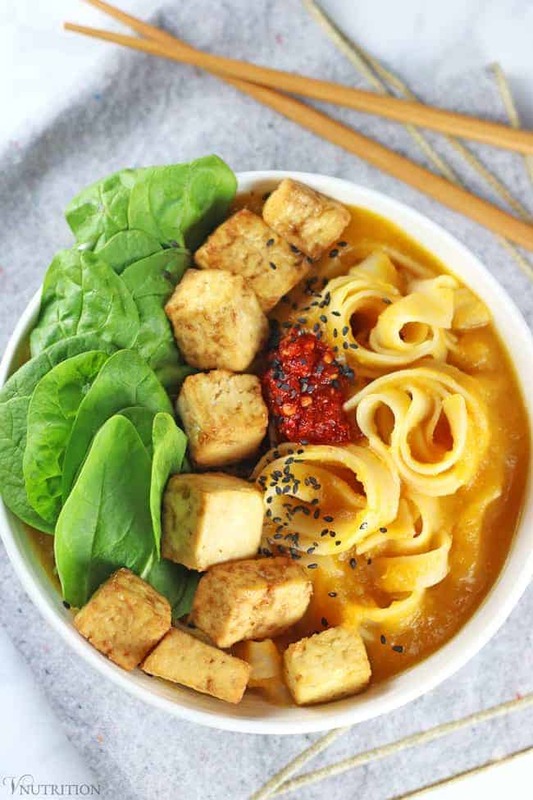 This healthy Butternut Squash Noodle Bowl came together in about 20 minutes because I prepped a few parts of the dish already. I roasted the butternut squash during my regular Sunday meal prep and I pressed and baked the tofu the day before. FYI, for more info on my meal prep tips, check out my Vegan Meal Prep post. For an even quicker meal, frozen butternut squash would work too, just heat it in a pan or microwave until it’s defrosted. You can sub in packaged pre-baked tofu too which you heat quickly in a pan or microwave as well just to get the chill off. Butternut squash is a wonderful source of Vitamin A. With butternut squash, you’ll be getting the carotinoids which help your vision, have antioxidant properties, and reduce inflammation. It also contains Vitamin C and fiber. Vitamin C is used to make collagen, speeds wound healing, and is another wonderful antioxidant. Spinach gives us a nice dose of iron while the tofu adds protein and calcium. It’s beneficial to have vitamin C with iron because the vitamin C makes the iron more absorbable. 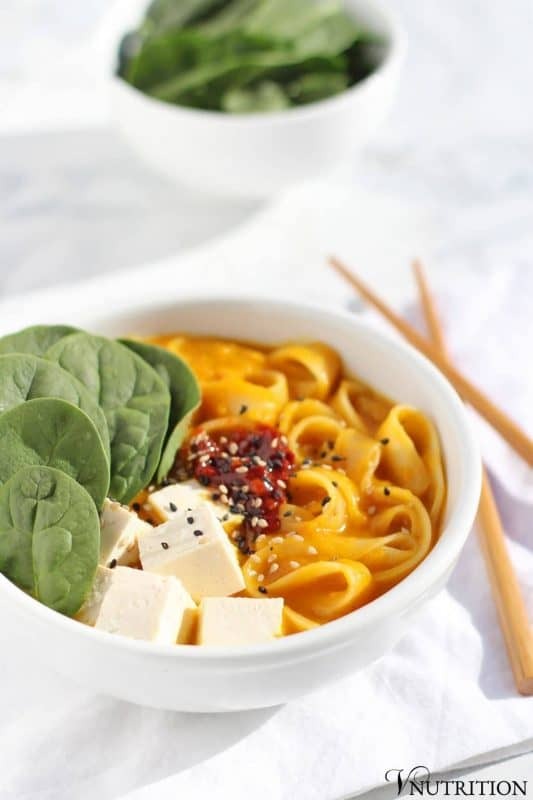 This Butternut Squash Noodle Bowl is easy to make and a healthy meal for dinnertime. It's gluten-free and creamy without the dairy. This warming bowl is the perfect for those chilly nights when you need some comfort food! Cook noodles until they are just shy of al dente and set aside. Meanwhile, add olive oil, onion and garlic to pan and cook for 3-5 minutes. Add onion & garlic along with veggie broth, butternut squash and tamari to a blender and blend until smooth. Transfer the sauce to a large saute pan/pot and bring to a boil. Lower heat to medium/low, add rice noodles, and cook the noodles to your liking. If the noodles soak up more of the sauce than you'd like, feel free to add a little more veggie broth to make things saucier. 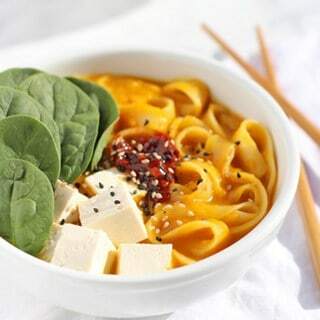 Add to bowls, top with spinach, tofu, sambal oelek, and sesame seeds. I baked my butternut squash the day before by cubing it and baking for 30 mins at 400 degrees. You can also substitute pre-cooked frozen butternut squash that is heated in the microwave. For baking tofu: I use a 16 oz block, press the water out, season with tamari and garlic powder, then bake for 20 minutes on 400 degrees. If you want, bake them at the same time! 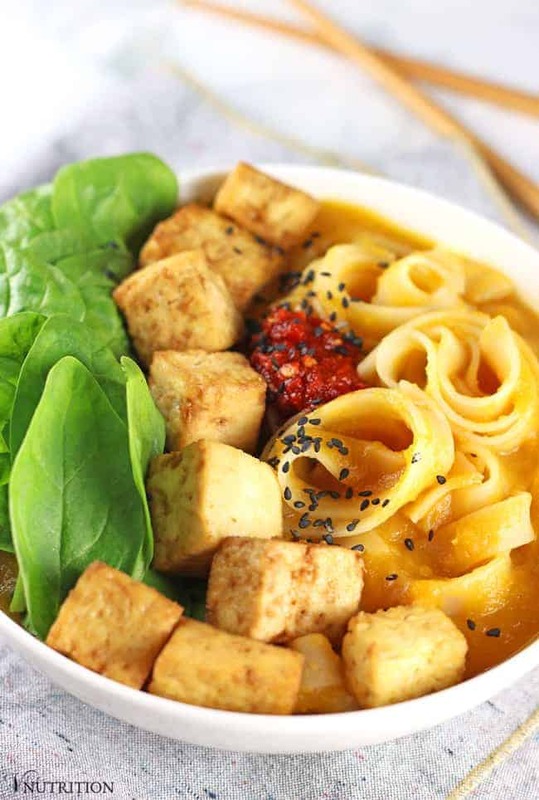 I’ve also made this Butternut Squash Noodle Bowl with silken tofu. 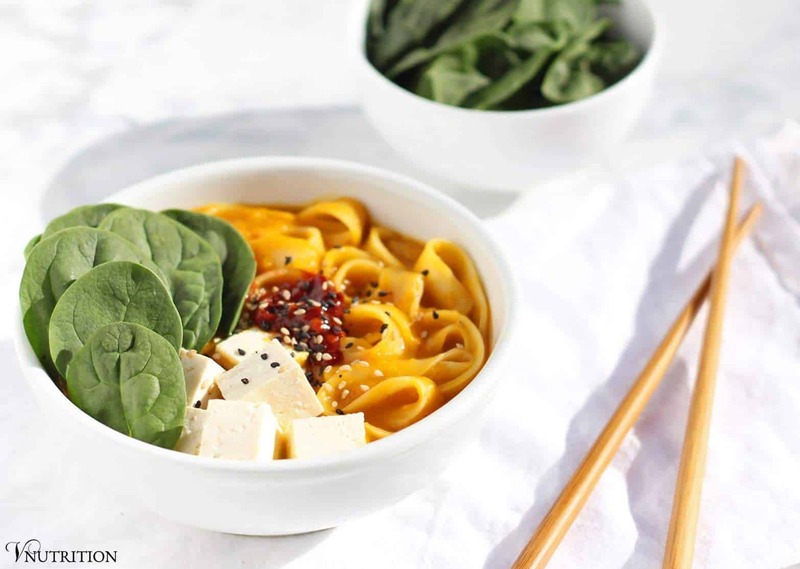 The silken tofu doesn’t need to be cooked and blends in nicely to the creamy noodles. It’s another option if you need an even faster meal. 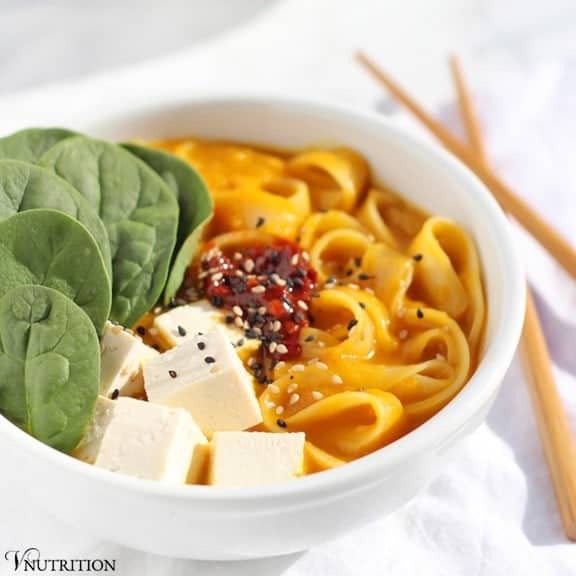 Like my Butternut Squash Noodle Bowl recipe? 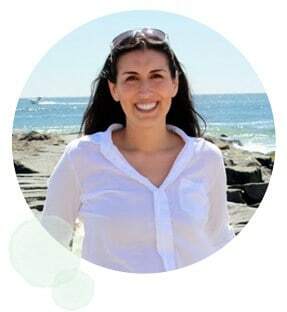 It would be so wonderful if you could give it some love by sharing it! This looks like my kinda of comfort food! This looks good Mary Ellen! 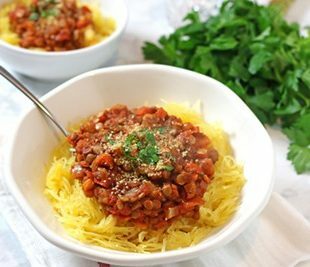 I haven’t had butternut squash noodles in so long, I’ll have to pick some up this week! I really do like asian food, but don’t cook with it enough. This bowl is STUNNING! I’d love to have it for lunch. Thank you so much Julie! I actually have to stop myself from cooking Asian food every night! Looks delicious Mary Ellen! I like how you combined sweet butternut squash with spicy sambal. What a beautiful bowl of nutritious and delicious food! I would love a big bowl. Wow, this looks like the perfect winter meal – thanks! This looks like a cozy bowl of comfort food! Thanks so much Becky! It is! I love noodle bowls. I’d be all over this! 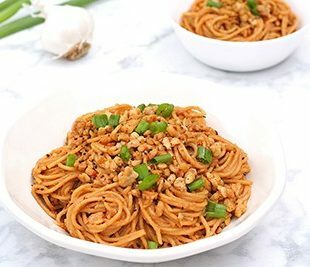 I love quick and easy meals like this. They are perfect when you need something healthy but it’s been a long day and you can’t be bothered to spend too long cooking. It looks so attractive too. The colours are beautiful! Thank you so much Mel! There’s so many nights I don’t feel like cooking so these are the meals I make!